When Camp Douglas was first opened, Chicagoans had free access to the site. Above, visitors with picnic baskets arrive at the camp. 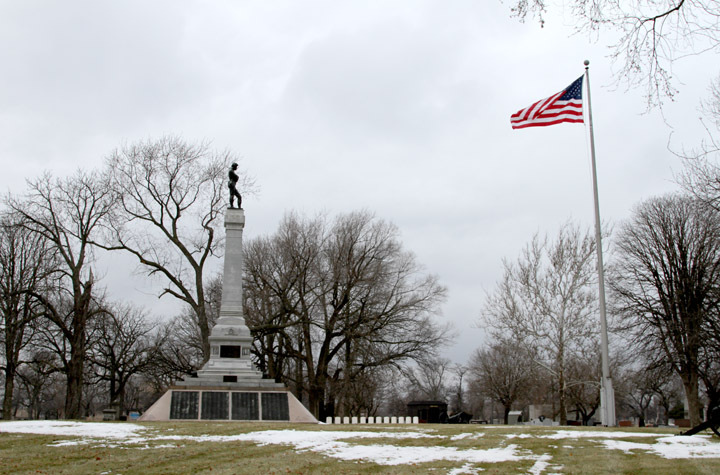 A monument in Oak Woods Cemetery at 67th Street and Cottage Grove marks the largest mass grave in the Western Hemisphere, or where roughly 4,000 Confederate soldiers who died at Camp Douglas are buried. 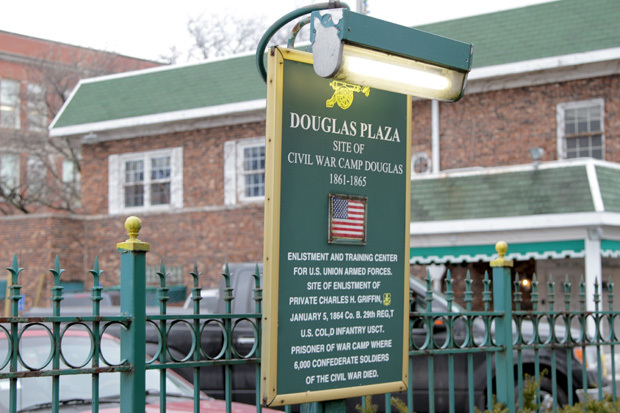 The first official acknowledgment of Camp Douglas was erected in the fall of 2014 outside of Ernie Griffin's former funeral home at 32nd Street and Martin Luther King Drive in Chicago's Bronzeville neighborhood. Sherry Williams, president of the Bronzeville Historical Society, says it's important to remember Camp Douglas as not only a prison camp, but also a place where black union soldiers and confederate prisoners intersected. 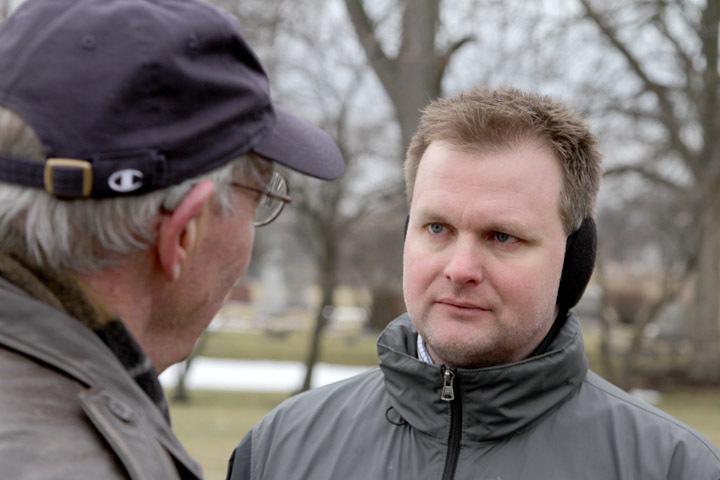 Curious Citizen Chris Rowland, right, at Oak Woods Cemetery in Chicago. Camp Douglas was one of the largest POW camps for the Union Army, located in the heart of Bronzeville. More than 40,000 troops passed through the camp during its nearly four years in operation. What’s more — and this is where it gets gloomier — it’s been hyperbolically remembered by some historians as the “deadliest prison in American history” and “eighty acres of hell.” So the fact that Chris, despite his earnest attempt, didn’t find much on Camp Douglas interested Curious City, too. How could one of the deadliest Civil War prison camps virtually disappear from our collective memory? Answering this part of Chris’s question had us consider how a city acknowledges the darker parts of its past and the benefits, if any, of remembering them at all. Located on the South Side of Chicago around 31st Street between Cottage Grove Avenue and present-day Martin Luther King Drive, Camp Douglas occupied roughly four square blocks — about 80 acres total — and operated from 1861 to 1865. Back then the area was the country, outside the city limits. Today, it’s Bronzeville. When it opened in 1861, Camp Douglas was a training and enlistment center for Union soldiers, a pit stop or starting point for soldiers headed to the battlefield. In other words, it had been improvised, and wasn’t meant to hold prisoners or last more than a couple years. After all, no one thought the Civil War would go on as long as it did. But then, in February 1862, Ulysses S. Grant captured roughly 5,000 Confederate soldiers in a victory at the Battle of Fort Donelson at the Tennessee-Kentucky border. With nowhere else for the captured troops to go, Camp Douglas became a Union Army prisoner-of-war camp, and it stayed one for the duration of the war. As it turns out, Chicago’s role as a transportation hub made it an ideal location first for a training camp and, later, for a prison. Eight railroads crisscrossed the region in a spaghetti soup of tracks that allowed goods to move to and fro. Young men could travel from various parts of the state to enlist. From there, the Union Army would assemble regiments and brigades and ship soldiers by rail to the front lines. What’s more, the camp’s location was directly off the Illinois Central Railroad. At the time, this was the longest railroad in the world, running from Cairo, Illinois, along the Ohio River, to Chicago. History buffs may recall that at the beginning of the war Cairo was General Grant’s staging location for Union attacks on the Confederacy. Once he captured Confederate troops, they were only a steamboat and train ride away from Camp Douglas. “Camp Douglas was Chicago’s principal connection to the Civil War,” says Theodore Karamanski, a history professor at Loyola University in Chicago and the author of Civil War Chicago: Eyewitness to History. Camp Douglas’ makeshift nature showed in its rickety wooden barracks and crude sewer system. Soon, though, the camp was taking on more and more prisoners and keeping them for longer and longer. But because neither side intended on taking large numbers of prisoners for extended periods of time, Camp Douglas — as well as most other Civil War prison camps — proved unprepared to handle them. “That is when all the prison camps got a lot nastier,” Karamanski says. Karamanski estimates that during the Civil War only one in three soldiers died on the battlefield. The rest died in prison camps or camps of their own army. “Disease was rampant in Camp Douglas and it was rampant in the Civil War. More people in the Civil War died of diseases than from bullets,” says David Keller, the managing director of the Camp Douglas Restoration Foundation and the author of a forthcoming book about the history of the camp. While Camp Douglas may have claimed more Confederate lives than any other Union prison camp, it pales in comparison to Andersonville, a Confederate prison in Georgia that offered neither barracks nor fresh water to its Union prisoners. In all, 13,000 men, or 28 percent of the total prison population, perished there, Karamanski says. Given these details, it’s probably no surprise that escapes occurred regularly at the camp. Many escape attempts were made by digging tunnels into the soft, swampy ground, but most came from bribing the guards. It is estimated that roughly 500 prisoners escaped from Camp Douglas one way or another. Again, security was lax because the camp had never been intended to hold prisoners. “They barely had any kind of wall up,” Karamanski says. “Some of the prisoners would just wander off and say ‘Hey, let’s go get a drink.’” Drunk and emaciated soldiers (still wearing their Confederate garb), would be picked up by local police and hauled, stumbling, back to the camp. Recall that Chris, our question-asker, could find little about the camp — as though the place had become a secret. Secrecy was certainly not the case during the war, though. 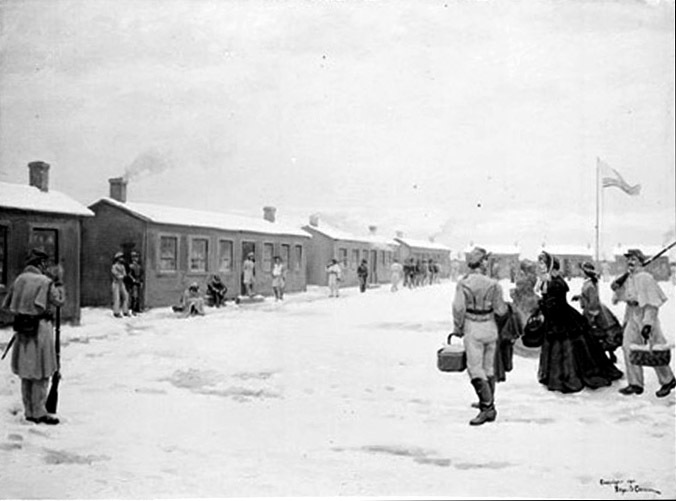 In the camp’s early days, Chicago residents were allowed free access to the camp. “People were excited that here was the enemy, tamed, incarcerated and for your viewing,” Karamanski says. Sometimes, though, visitors — likely Confederate sympathizers — would end up walking out with a prisoner. Soon, though, the camp tightened up security and stopped admitting visitors. At that point, a local businessman got an idea. Utilizing a hotel across the street from the camp, he built a viewing platform where he charged customers 10 cents a pop to climb a stairway up to a wooden platform to catch a glimpse of the rebels. “It was a real treat for a lot of kids to see those Confederates,” Karamanski says. Above: An 1864 illustration of Camp Douglas as seen from a Union observation tower, contrasted with a Google Earth view of the area today. The center bar can slide left or ride to hide or reveal either side. When the Civil War concluded in the spring of 1865, Camp Douglas’ prisoners were given a set of clothes and a one-way train ticket out of the city. The camp itself was razed, rather quickly, by scavengers as well as the government, selling off the equipment as surplus. When summer rolled around, though, the camp parade ground gave way to a new sport that returning union soldiers had learned during wartime: baseball. But Karamanski suspects baseball may have helped erase part of a larger memory, too: public memory, or in this case, the way a city tells the story of itself. For the most part, the history of that memory nearly had Camp Douglas written out. First off, the Great Chicago Fire came just six years after Camp Douglas closed, sapping resources and shifting the city’s priority away from the South Side. Then came the Great Migration, where hundreds of thousands of African Americans migrated North on the same railroad that once transported soldiers from Camp Douglas to the front lines of the Civil War. When they arrived in Chicago, African Americans began settling in Bronzeville. It’s safe to say probably the last thing on their mind was exploring their neighborhood’s lost history, centering on those who had previously fought to keep them enslaved. Then came the post World War II housing shortage and the urban renewal of the 1960s. “There was a lot of reason to forget about it,” Keller says of the camp. But at the center of this question of why Camp Douglas was forgotten is the obvious tension of an African-American neighborhood and a city rooted in Union ideals taking steps to remember thousands of dead soldiers who fought on the side to uphold slavery. And that strife over how to remember what happened at Camp Douglas didn’t come about over time. There was deep-rooted animosity toward the Confederate cause from the moment the war ended. The issue reared itself again in 1992, when The Commission on Chicago Landmarks proposed to make the Oak Woods mound a historic landmark, drawing the ire of black alderman. “Here is a group of people who looked upon my people as animals, as subhuman,” then-Alderman Allen Streeter told the Chicago Tribune. “I’d rather forget about the whole thing,” he added. That’s the same year that Ernie Griffin got involved. He ran the Griffin Funeral home at 32nd Street and Martin Luther King Drive — right smack on the former camp’s site. The African-American funeral operator learned his grandfather had enlisted in the 29th U.S. Colored Infantry at Camp Douglas. Griffin decided, much to the neighborhood’s chagrin, to erect a memorial to honor the dead rebels. It included a Confederate battle flag flown at half-mast. “This was like an incitement to many African Americans,” Karamanski says. After the flag kept getting torn down, Griffin took out an ad in the Chicago Defender, the city’s African-American newspaper. In his book, Karamanski quotes Griffin, saying, “The flag is not a symbol of hate. It is a symbol of respect for a dead human being.” Griffin has since died, and the memorial was taken down when the funeral home closed in 2007. According to Karamanski, one of the most important things to keep in mind while trying to preserve history is the way we tell stories about the past ... as well as who tells them. “If we try to memorialize Camp Douglas in such a way that we don’t share the story, share the authority in creating the site with the people in the community, then you’re asking for trouble,” he says. It’s a lesson being considered by Bernard Turner and David Keller, directors of the Camp Douglas Restoration Foundation, which plans to build a museum somewhere on the site of the former camp. Keller says they are “very, very close” to being able to announce a location. “I think it’s important to know what’s in your neighborhood,” says Turner. “I think it’s building community pride,” adds Keller. After the rocky attempts to memorialize Camp Douglas and the soldiers who died there, seeking to remember Camp Douglas has been going more smoothly lately. In 2014 the foundation helped persuade the Illinois Historical Society to erect the first official acknowledgement of the camp: a small plaque at 32nd Street and Martin Luther King Drive informing residents and passersby that they are in fact walking upon significant history. The foundation’s also included the local public school, Pershing East, in its various projects, which include two archeological digs of the site. And it has discussed its efforts with the DuSable Museum of African American History. 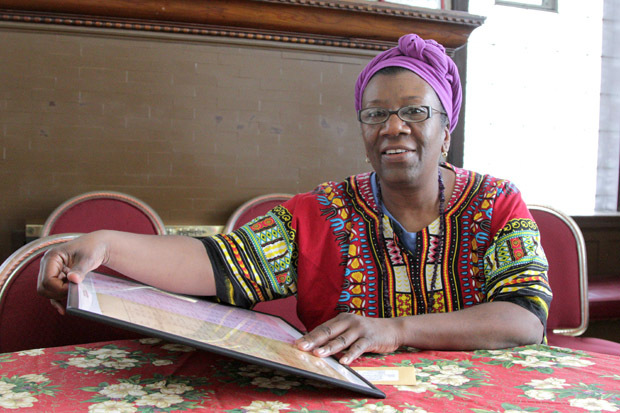 For Sherry Williams, president of the Bronzeville Historical Society, there’s potential in telling stories about Camp Douglas that move beyond its brutal legacy. One such narrative hits close to Williams. After looking into the camp’s death records, she discovered that a soldier named S.G. Cooper died at the camp. He was a Southerner whose family owned her direct ancestor, Nero Cooper, a former slave who enlisted in the Union’s African-American infantry. Still, Karamanski says, it’s okay if the way we remember Camp Douglas is kind of dark. Chris Rowland is a 36-year-old sales engineer at a South Side manufacturing company. He lives in Uptown and was reading Uncle Tom’s Cabin when he got to thinking about the Civil War and what connection Chicago might have to it. He says one of the guys thought the name might have been Camp Burnham. Another guy thought the camp was called the Andersonville Prison, confusing the name of Chicago’s North Side neighborhood with the famous civil war prison camp in Andersonville, Georgia. But when Rowland searched a bit more on Google, he learned about the camp’s real name, but not much else. When he submitted us this question about a year and a half ago, he says he was surprised at how difficult it was to find any information about Camp Douglas. And though he’s not a Chicago-native — or a history buff, he says — learning more about Camp Douglas, Chicago and the Civil War has put a bit of his own life into perspective. Correction: An earlier version of this story misstated the location of where Mr. Nero Cooper had enlisted in the Union Army. According to Sherry Williams, he enlisted in the Union Army in Tennessee.